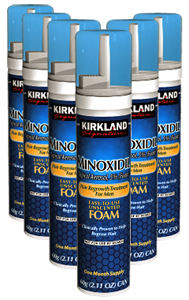 Minoxidil Foam 5% aerosol is a topical treatment that helps grow hair on top of the scalp. Male pattern baldness affects up to one-third of all men. By the age of 50, approximately 85% of men have significantly thinning hair. Male pattern baldness is responsible for the vast majority of male hair loss. Male pattern baldness is a condition that can be inherited from either parent. Direction: Apply half a capful 2 times a day to the scalp in the hair loss area. Massage into scalp with fingers, then wash hands well. See enclosed leaflet for complete directions on how to use. Using more or more often will not improve results. Continued use is necessary to increase and keep your hair regrowth or hair loss will begin again. Inactive ingredients: Butane, butylated hydroxytoluene, cetyl alcohol, citric acid, dehydrated alcohol, isobutene, lactic acid, polysorbate 60, propane, purified water, stearyl alcohol. Store at 20-25 C (68-77 F). Contents under pressure. Do not puncture or incinerate container. Do not expose to heat or store at temperatures above 120 C (49 F). Warnings: For external use only. For use by men only. Extremely flammable. Avoid fire, flame, or smoking during and immediately following application. Before use, read all information on package and enclosed leaflet.